Local fans of Los Fabulosos Cadillacs, one of Argentina's greatest rock exports, got a rare treat in the mid-'90s. At a time when the band was routinely selling out soccer stadiums, it played an intimate show at the now-defunct Garage club, floating on a more modest buzz in the United States. Their "hit," "El Matador," was on rotation on MTV and featured in the 1997 John Cusack vehicle Grosse Pointe Blank. 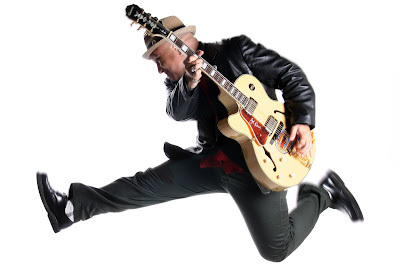 Sadly, the band didn't build on the attention: A few years later, various members went solo, just as the Rock en Español movement they helped ­create—a then revolutionary mix of ska, folk, jazz, salsa, rap, reggae, and rock—began to take off, making groups like Juanes, Maná, and Café Tacuba mainstream acts in Latin America and parts of the United States. 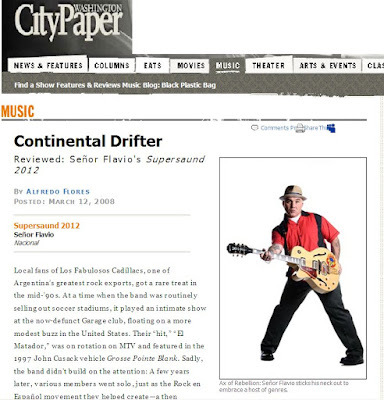 Los Fabulosos Cadillacs still occasionally tour, but founder Flavio Oscar Cianciarulo, aka Señor Flavio, is deep into his own career: Supersaund 2012 is his seventh album and first to be released here. He's recently worked with acts like Mexican ska band Panteón Rococó and Panamanian rockers Los Rabanes, and his travels have paid dividends: The new album integrates some of the funk, roots-rock, reggae, and grunge he's dabbled in for the past decades along with mellower, older sounds from music across the Americas. On "Malito," he sings tongue-twisting lyrics about bad love over a ska beat, mixes it with an infectious chant on the chorus, while a gruff-sounding reggae singer grunts over a rapid-fire drumbeat. "Polaroid 66" could easily pass for a track made that year, as smooth electric organ blends with pleasing surf guitar, both of which Flavio plays on the disc. He even pulls off a great doo-wop tune with "La Herida," bringing in Daniel Flores of the Argentine ska group Satélite Kingston on electric organ and Flavio's 10-year-old son, Astorboy Cianciarulo, on drums. (The album was recorded in Mexico and Argentina, and features a raft of musicians from both countri es.) Traditional Latin sounds are mixed in with American themes: "Tropicana 50" foregrounds an Afro-Cuban swing beat, and "Cristina" features backup vocals and mariachi-style shouts from Juan Carlos Goméz of Mexican reggae group La Verbena Popular—the cumbia-ska-rap union with a familiar reggae feel, despite its Spanish verse "No todo es una fiesta de ganja" ("Not everything is a ganja party"). There's even a hint of British punk on "Lucha Libre Lovers" and "El Apagón." There's no rhyme or reason to Supersaund 2012, but Flavio makes it all work. Los Fabulosos Cadillacs, after all, were famous for their lack of a musical center, playing Caribbean music, covering "What's New Pussycat?" with Fishbone and playing with the Clash's Mick Jones. Flavio's solo career may not have the long-term impact of his old band, but he's still able to give old and new fans something worth dancing to.